The original article in Russian can be found at the RCF website. Spassky is a genius of a chess player. He was and is a part of the great history of chess. He trained himself and his character, because at one point he was impressionable and emotional, which prevented him from achieving victories. But he worked on himself and was able to change, to become World Champion. His matches against Petrosian and Fischer have of course become part of the treasury of chess history. I know he’s had health problems and I wish Boris Vasilievich a quick recovery of the old strength he always had. I also hope he can continue to promote chess actively and come to visit us often in Russia! I want to congratulate Boris Vasilievich on his birthday and to wish him, above all, good health! He’s had a difficult time in the last couple of years but it seems the situation has stabilised and things are on the mend. I’d like Spassky to return to active chess life as soon as possible, especially as that’s something he really wants himself. He’s a sociable man and loves meeting different people. Today I don’t want to speak about him as a chess player – plenty’s been said about that, including in the long interview I devoted to the World Champions. I’d like to speak about him as a personality. For me, the main lesson of his life is that Spassky always acted in accordance with his own convictions. It seems to me that he lives in harmony with himself. Boris Vasilievich never flirted with the authorities. He never settled for awkward compromises. When the Soviet system collapsed many people had a favourite excuse: “That’s just how the times were. What could we have done?” Those people joined the party at the first possible moment, then left it at the first chance they got, they informed to government agencies… They say: “We’re not to blame, that’s what the times were like!” I really don’t like that, as I think a person always has a choice. 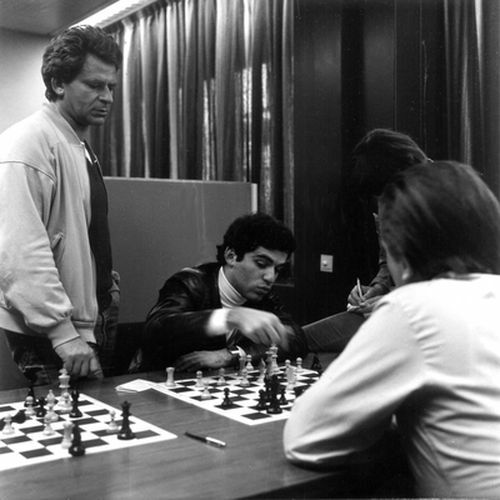 Spassky, as well as Tal, prove that really was the case. Adapting to the “rules of the game” imposed by the times is the fate of weak and calculating people. Always remaining true to himself is, in my view, one of the main personal achievements of Boris Vasilievich. Spassky is now living in the Parisian suburbs, while I’m in the city itself. Of course, we sometimes talk on the phone and I’ve visited him at home a few times. 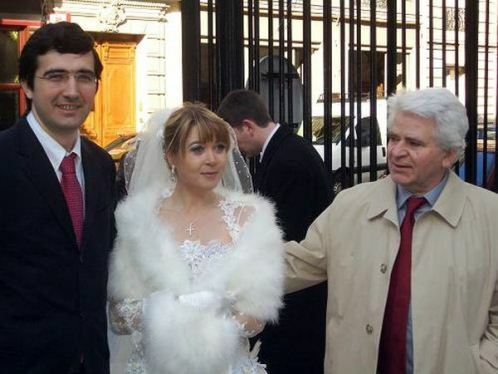 Boris Vasilievich was at my wedding, for which I’m very grateful to him. In 2001 or 2002 on the way to the tournament in Monaco I spent a few days with him at his dacha near Grenoble. The nature there is fantastic: the air is pure and there are wild boars running about! Each day we went for a long walk. I was really amazed at Boris Vasilievich’s physical condition back them: he was something like 65 but could walk around for 3-4 hours, and at a good pace. Frankly, after such walks I felt pretty tired, but Boris Vasilievich urged me: “Come on, maybe we can do another circuit!” That was quite a decent circuit, a couple of kilometres. He told me a lot of stories. In general, he was a wonderful story-teller. About Mikhail Moiseevich [Botvinnik] and other chess legends. In the evenings we’d dine together with his wife, always over wine. But the food was in the Russian style – baked potatoes, something else, and the conversation continued. He showed me his office, his old journals. I dug around in his chess library – it was incredibly interesting. We had a great time! We even went to play tennis a couple of times. I think everything will be ok and Boris Vasilievich will recover, because overall his health is very good, herculean. The main thing is that he doesn’t lose heart and believes that he’ll soon be back among society. Of course, I want to personally congratulate Boris Vasilievich, so I’ll phone him now and, I hope, I’ll be able to see him soon! Boris Spassky was my first chess idol. 1969, when I started to play chess, was precisely when he became World Champion, and my dad supported him. 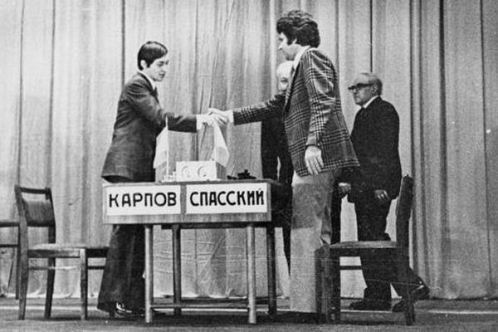 The “Petrosian – Spassky: 1969” match collection was my first chess book. And years later, on the foothills of Olympus, it was precisely under the influence of Spassky’s games that as Black I armed myself with the Tarrasch Defence and the Tartakower-Makogonov-Bondarevsky System. At the time Boris Vasilievich gave me, a young man, valuable chess advice, and always had a friendly attitude towards me. As my elder he didn’t call me anything other than “Akimych”. His wit was the stuff of legends. In 1985 he christened the FIDE President “Karpomanes”, while in 1986 at the Olympiad in Dubai, when I started to fight for chess democracy and was busy creating the GMA, he instructed me: “Chess, Akimych, is a monarchist game…”. It’s a pity Spassky still hasn’t got round to writing a book – there’s a lot that he could tell. While congratulating you, dear Boris Vasilievich, on your glorious anniversary, I want to wish you the quickest possible recovery. And please continue to delight us with your brilliant aphorisms! How many chess legends can you recognise? What a fantastic tribute from Kramnik. It says so much about Kramnik himself, as well as about Spassky – two wonderful people, as well as great players. I recognized all of them! I am pretty sure the picture is taken at a Dutch tournament – say Tilburg. I checked participants of each Tilburg tournament from the right period and I can’t match the legends. 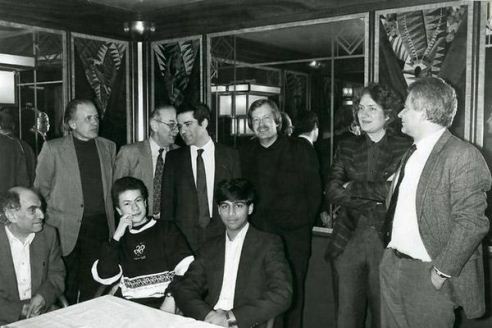 I see (from left) Tal, Larsen, a younger man (sitting) whose face I know but whose name escapes me, a bit older man standing whom I am not sure I know, Kasparov (I think),Anand (sitting), another famous chess player whose face I know but can’t place the name (without googling, which is not fair), Timman, and Spassky. I am now completely obsessed with trying to remember the name of the younger man, third from the left. Help! Is it Vlastimil Hort, the third to the right? But neither those sources nor the RCF give the location/date. Glad to see the site back with posts. Kramnik’s piece was very nice. On a different note, does this mean that you are no longer working for whychess? since it has been a while since the English version was updated. Yes, I’ve stopped working there as the whole site’s stopped, at least for now. I might well end up working somewhere else, though I hope if I do I won’t have to neglect this site quite as completely as I did while working full-time at WhyChess. Very appreciated, mishanp, that you came back! At least twice a week i droped in to look if there’s something new. I also like very much the articles about Spassky. It’s a pity that there is not much more on the net. 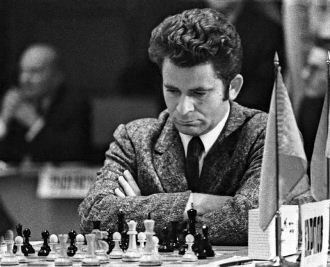 I think Spassky was a real powerful player in the sixties – and it’s a pity too that his name is seemingly mostly connected with this loss to Fischer. So the whole whychess website has stopped? This website and whychess are my favorites. Whychess was definitely the top chess website available in my opinion. It’s a real pity if it closes as it barely even started.. Thanks, and I agree it’s a real pity. There might still be a chance of it being resurrected, although today it hasn’t been accessible at all. I was thinking at some point of putting up a post here with links to some of the best things there. what if the site goes down forever? if you still have ownership of the articles, maybe you could copy the articles themselves?? I did actually make a copy of the site after posting my last article, so if it came to that and Vlad Tkachiev agreed I could repost the articles (or most of them). Anyway, the site’s back up – it seems comments were just being switched off and spam deleted. We in the West was off course quite thrilled with the Fischer -Spassky outcome in 1972, maybe for the wrong reasons. HOWEVER, growing older I came to realise what a gentleman Boris Spassky is. And in harmony with himself, a balanced person with natural chess genius. I learned that the “escaped” from a Parisienne hospital earlier this year, 2014. Hope all goes well after your stroke Mr. Spassky! Your games are so instructive and you serve as a true example of being a humble person.